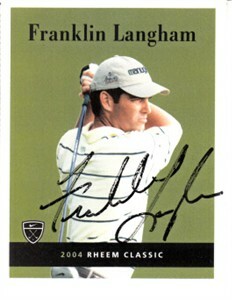 Rare 2004 Nike Golf trading card autographed in black marker by 1991 Walker Cup Team member and former PGA Tour player Franklin Langham. Obtained in person, with certificate of authenticity from AutographsForSale.com. ONLY 2 AVAILABLE FOR SALE.